The original New York Times article that this recipe is based on went something along these lines: the writer had a summer house in Maine, and had lots of summertime houseguests, many of whom had their hearts set on a lobster dinner. So they had many a suppertime filled with lobsters being boiled and cracked, with all the stuff that goes with that (pieces of errant shell flying all over the place, lobster juice drenching everything, etc, etc.). And the point of the article was, wouldn’t life be wonderful if you could make a meal that included all of the lazy, delicious, summertime taste of lobster without all the shell-cracking, juice-flying, sticky drama? That was a deliciously peaceful combination of lobster, pasta and the fresh herbs of summer? I’m here to tell you that yes. YES IT IS. Let’s make it! Anyway. You leave the lobster in this lovely marinade for 60 minutes, then you cook up some pasta, drain it, put in in a bowl and pour the whole lemony, lobstery, herby, garlicky concoction over the pasta. Toss it around a little and there you have it — a summery lobster dinner that smells incredible and tastes even better. We had this for dinner for the hundredth time a few days ago, and it was a work day for me. When I got home, my hearthrob of a Southern husband had already put the lobster into the marinade and it was waiting on the kitchen counter. The kitchen smelled incredible — all mint and basil and lemon and garlic and lobster — and all I had to do was make the pasta, mix it up and not mess up the picture. Now THAT is the way life should be. Combine lemon juice, olive oil, garlic, herbs and salt. Add lobster and let sit at room temperature for an hour. Cook pasta until al dente. Drain and return to pot. Pour lobster mixture onto pasta and toss. Oh. My. Gosh. Can't wait to try this . . .
YUM! What a gourmet pasta dish! This looks amazing–just one question, do you bake the lobster or boil it? Actually, I usually have the supermarket steam it for me, so it is all cooked when I take it home. Most good seafood sections at the major markets will do that if you ask. (I am big coward when it comes to cooking lobster.) But if I was going to do it at home, I would either boil or steam it, I think the meat comes out a bit more tender that way. This is a nice and refreshing post! The recipe is definitely a keeper! I can already tell with such simple ingredients, they can only enhance the sweet flavor of lobster! Thanks for posting and for sharing the recipe! Wow. This looks delicious and I will try this recipe whenever I get lobsters in hand! Can't go wrong with lobsters! Love your blog. thank you for the wonderful writing and food. searched for "the way life should be" recipe to find the story on new york times website. Sorry, but I don't know how to make the address look pretty in this comment box. Just highlight, copy and paste the gibberish looking address into your browser. I tried this with claws (because they were $2.99/lb at the market) & some shrimp and it came out great! But I ended up doubling all the sauce ingredients except the lemon, & 2 lemons was still too sour. I wonder if the ones I used are too large. Hi Kate, as someone who spends a chunk of the summer in Maine doing all that messy business with lobsters for a fairly steady stream of house guests – Thank You for this fabulous-sounding recipe! We did have a "tradition" a couple of years ago, when Ted would drive up for the weekends – he'd call me when he was at a certain point and I would put the lobsters on … we had marvelous late-evening feasts a deux! And, when Ted spent the day last summer photographing lobstermen in Friendship, Maine, he came home with 14 of the critters – now THAT was a feast (we were thankful for the houseguests)! I had a delicious seafood risotto last night with a poached lobster tail and I agree – this is the way life should be! Bet this would be delish with Alaskan king crab, too, in place of lobster….. I will cook this one for sure!! Looks delicious and sooo easy. Btw, I just want to know where to find a southern husband like yours! I live in the deep South and looking for a bright, not a Bubba, guy who likes working in the kitchen and… is decent to his wife! Haven’t found an older guy like that… but willing to keep my eyes open — and he cooks, too!! WOW!! thanks for the super recipe!! Best recipe title ever! And best husband ever. Sounds like you had a pretty amazing time of it! This looks lovely. “Welcome to Maine – The Way Life Should Be”. This wonderful recipe is another great example of Maine living. I had a HUGE lobster tail last night (sucker was about 2 pounds), and I definitely think eating lobster on the daily is the way life should be. So funny, because as I was stuffing my face I asked Boy, “can you believe there are people who don’t like lobster? ?” Those people are strange if you ask me. Needless to say, I am LOOOOOVING this pasta!! Light, summery and completely satisfying! I need this dish in my life. ;) Pinned! Cheers, dear friend! Don’t trust people that hate lobster! I totally agree Kate! Life should be filled with lobster! And what an incredible hubby you have! I think your hubby needs to teach my hubby a few things in the kitchen!! Thanks for sharing a have a great week! Beautiful recipe, Kate !! This pasta is just gorgeous! Now I am seriously craving lobster! That sounds like a wonderful article! Lobster is my favorite seafood (next to scallops and crab) but I agree, it can be so time consuming to cook! This pasta is right up my alley! My husband is a huge scallop fan – I should add scallops the next time I make this and we will both be in heaven! Oh my goodness. This IS the way life should be. This is pretty much my dream meal. I know what I want for my birthday! Yay Maine!! And, yay lobster!! I need lobster on my menu more often. Maybe if I lived on the east coast I would think about it more! 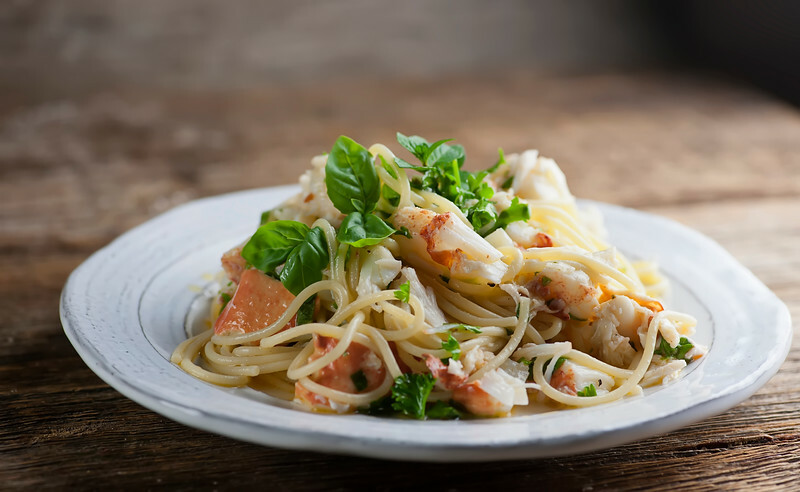 This lobster pasta dish looks divine! Kate! You have been killing-it with each and every seafood post. I love lobster and what a lovely way to introduce my children to the wonderful flavors going on in this dish! Thank you.